In case you haven’t heard, there’s an important college football game tomorrow other than the Battle for the Sweet Sioux Tomahawk Trophy. Having a #1 vs. #2 matchup in the regular season is rare enough, much less when it involves the greatest rivalry in sports in Michigan-Ohio State. Duke vs. UNC is the only other rivalry that comes close, although since college basketball regular season games don’t carry that much weight, their head-to-head tilts are really more for bragging rights. I’ll grant that the Yankees-Red Sox rivalry is exciting when they meet in the ALCS, but when they’re playing close to 30 times per year when you include spring training games, it’s overkill to make the case that it’s Armageddon everytime that they meet on the field. 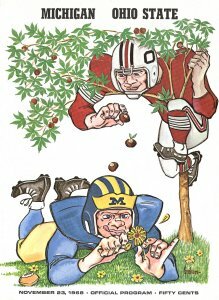 In contrast, Michigan and Ohio State only play each other once a year on the gridiron in front of stadiums holding over 100,000 specatators with, more often than not, a berth in the Rose Bowl or, in this year’s case, the national championship game on the line. Pound for pound, there’s nothing else better in sports. My favorite moment in history from this rivalry is captured on this YouTube video where the Ohio State players rip down the Michigan banner prior to the legendary 1973 game where the two undefeated teams played to – what else – a 10-10 tie. It was a glorious trash-talking moment decades before such actions became passe. Despite all of this internal vitriol during the regular season which can’t be duplicated at the pro level, however, there’s also the countervailing notion of conference pride. For instance, there are few things I enjoy more than watching Michigan lose in football, basketball, volleyball, moot court tournaments, electrical engineering challenges, business school case study competitions, etc. Yet, when it comes down to a BCS or NCAA Tournament berth, as long as they aren’t taking a spot away from Illinois, I’d much rather have the Wolverines grab it as opposed to a team from another conference. Part of this, as the late and great Milton Friedman would say, purely due to self-interest. While it behooves the Bears to have all of its NFC North rivals go 0-16 for the year, the perception of your college team is intricately tied to the strength of that team’s conference. Witness what’s happening to Rutgers this year where, if they finish the season undefeated, they probably will not make the national championship game due to the perceived weakness of the Big East. On the other side, Florida will get every benefit of doubt if it comes out as the SEC champion. Whether you’re talking about BCS or RPI rankings, recruiting wars, or the sports punditry, your college team directly benefits from the success of your college rivals. Thus, while there’s no reason for me to ever consider wanting the Packers to win unless a Bears playoff spot would result from it, there are a whole lot of reasons why I would want the all of the Big Ten teams to sweep their non-conference schedules regardless of where the Illini are in the standings. At a more amorphous level, there’s also this notion of conference pride. The fact that Illinois is a member of the Big Ten is an integral part of the school’s identity and isn’t taken lightly. For me, this has personally become a larger deal since leaving the bubble of Champaign, where the superiority of the Big Ten is never questioned, to come back to Chicago where I work side-by-side with yahoos who swear by SEC football or ACC basketball. It’s nice to counter their quaint misguided biases with the fact that, in terms of fan intensity, the Big Ten always leads the nation in attendance for both basketball and football, and in terms of excellence in competition, our conference is the only one other than the SEC (which has the benefit of having 12 teams as opposed to 11) that regularly places multiple teams in both the BCS bowls and the Final Four. Plus, on the academic side, one only needs to look at the U.S. News rankings to see that the Big Ten from top-to-bottom is whole lot stronger than any of the other BCS conferences. I might hate Michigan and Ohio State as an everyday matter, but as a celebration of what it means to be a Big Ten alum, I absolutely love their rivalry. No matter who wins tomorrow, the Big Ten is going to come out on top. This one is as difficult as when Detroit played the Cubs last season. If only they could both lose. As much as it pains me, I’m rooting for Michigan. Michigan winning by a substantial margin is definitely the optimal scenario for your Irish. If Florida can’t get through FSU and the SEC Championship unscathed, the USC-Notre Dame game essentially becomes the second de facto playoff game to get to the national championship. If Ohio State wins, however, I think it’s going to be a stretch to see ND climb past Michigan in the BCS rankings no matter what happens because, assuming ND can beat USC, the Irish’s lone loss will have come against those same Wolverines (which was pretty decisive). I know the thought of rooting for Michigan has got to be a pretty tough assignment for you, though.